We've heard so much about the rumored-to-be-released iPhone 5S and iPhone 5C that it feels like the devices are already available. Alas, here's a bit more news about Apple's still-fabled devices. The good news is with Apple's supposed Sept. 10 unveiling event just a few weeks away, it sounds like both phones will become a reality. According to the Wall Street Journal, sources have revealed the Cupertino-based company has tasked its supplier, Hon Hai Precision (a.k.a. Foxconn) with delivering two different iPhones next month. It's a bit of a change in how Apple has done things in the past, but with Apple, Samsung, Sony, HTC and Google all vying for a cut of that smartphone userbase, a change just might do the fruity firm some good. Apple has traditionally stuck with just the one model of iPhone per year since the device launched, while competitors have recently opted to double-, triple-, or even quadruple-down with mobile phones. Samsung has already released the Galaxy S4, S4 Mini, S4 Active, S4 Zoom and has the Galaxy Mega dropping before the end of the month. The same could be said for HTC and Sony, which have each delivered standard versions of flagship phones (HTC One, Xperia Z) and variants designed to capture more of the market (HTC One Mini, Xperia L). Apple's rumored plans have been poorly guarded, with both the flagship iPhone 5S and budget-friendly iPhone 5C making waves for months. While other manufacturers have seemingly been pumping out phone after phone after phone, Apple has been content to stick with its annual releases, though that slow pace has drawn some concerned looks from Apple's board. Still, while Samsung is reportedly readying its Galaxy Gear smartwatch for a September debut, Apple's focus on phones rather than hybrid devices may actually give the company a bit of a focused edge. Of course, adding a second iPhone to the slate isn't the only way Apple is believed to be dramatically adjusting its smartphone strategy. 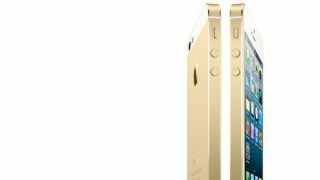 AllThingsD is reporting the golden iPhone 5S is going to make its grand debut during Apple's September event, which will give the device a new color scheme for the first time since white was added to the mix with the iPhone 3G. There is plenty of support for this rumored device, including how the design will actually look, and that the golden hue will resemble a champagne color more than the mineral. The side and rear of the iPhone 5S will sport a golden frame, while the front will remain the now standard white, with the top and bottom edges of the rear also featuring white highlights. According to the site's report, gold is being added for multiple reasons, with its ease in anodizing and the recent uptick in gold jewelery sales in China among the leading factors. Even if adding a new color scheme and a budget model aren't terribly innovative decisions, Apple is banking on these small differences to help boost slowing smartphone sales. But what about Apple's iWatch? Check out the latest news and rumors for the latest details.